Mar 11, 2009 - searching of apicomplexan genome sequences revealed an ortholog in ..... both genes was detectable in both life cycle stages, although these. 337. ACKNOWLEDGMENTS. The authors thank Dr. MÃ¡rio E. Camargo and Kenneth Ely for their .... WAINSTEIN, M.V. ; WOLFFENBUTTEL, L.; LOPES, D.K. et al. Aug 15, 2014 - determine toxoplasmosis seroprevalence in this cat population. Tissues .... (24 nt, TOX FLU, labeled at the 39 end with fluorescein) and 59-. Leishmaniasis Research Centre, Isfahan University of sciences, Isfahan, **School of ... Keywords: Sero-prevalence, Toxoplasma gondii, Infection, Isfahan, Iran. Oct 9, 2014 - Nathan C. Manley1,3,4, Robert M. Sapolsky1,3,4,5. 1 Department of ...... Manley NC, Caso JR, Works MG, Cutler AB, Zemlyak I, et al. (2013). International Journal for Parasitology 32 (2002) 27â38. 0020-7519/02/$20.00 q 2002 Australian Society for Parasitology Inc. Published by Elsevier Science Ltd.
MTOC were detached from the nuclear envelope and associated with the PV. Live-cell imaging of infected. PtK2 cells expressing fluorescent a-tubulin illustrated. Nov 24, 2016 - Toxoplasma gondii is an important protozoan parasite ... www.parasite-journal.org ..... International Journal for Parasitology, 44(2), 91â98. 35. Medicine Idi-Araba, Lagos, nigeria; .... 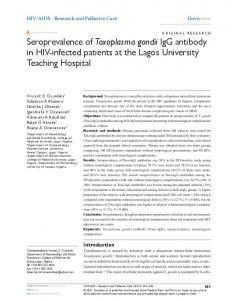 This study was carried out at the Lagos University Teaching. Hospital, Lagos State in the south-west region of Nigeria. Oct 25, 2012 - Rupshi Mitraa, Robert Morris Sapolskyb, Ajai Vyasa. 5 a School of Biological Sciences, Nanyang Technological University, Singapore 637551,. Sep 9, 2008 - family in Apicomplexa. ..... conducted pulseâchase labeling experiments. ... an excess of unlabeled amino acids for an additional 2 h (chase). searches to identify homologs of the plant inner chloroplast membrane translocase component Tic20 in apicomplexan parasites. We identified Tic20 homologs from all of the available genomes of apicomplexans, with the noted exception of the plastidless genus Cryptosporidium. Alignments of apicomplexan Tic20 homologs with plant, red algal, diatom, and cyanobacterial counterparts [supporting information (SI) Fig. S1] reveal the presence of an N-terminal extension with characteristics of a bipartite apicoplast targeting sequence. Similarity to plant and algal Tic20 homologs resides in the C-terminal portion of the protein, although very few residues are conserved between all homologs depicted (Fig. S1). TgTic20 Is an Integral Protein of the Inner Apicoplast Membrane. succession at the C terminus of the protein (Fig. S1). To determine whether TgTic20 is an integral membrane protein, we performed sodium carbonate extractions and Triton X-114 phase partitioning. Sodium carbonate extractions resulted in TgTic20 localizing to the membrane fraction, much like the characterized apicoplast phosphate transporter [APT1 (9)] and unlike the soluble ACP (Fig. 1C). Much, but not all, TgTic20 localized to the detergent (i.e., membrane) phase during Triton X-114 phase partitioning, again consistent with a membrane localization for TgTic20. To characterize further the subcellular localization of TgTic20, we performed transmission immunoelectron microscopy on parasites expressing TgTic20-HA, labeling with anti-HA and anti-ACP antibodies. This action revealed the localization of TgTic20-HA to membrane-bound organelles that also contained ACP (Fig. 1D), consistent with the apicoplast localization of this protein. Localization of TgTic20-HA within the apicoplast was generally confined to the membranes of the organelle, consistent with the membrane localization of TgTic20, whereas ACP was distributed throughout the entire organelle. Four membranes surround the apicoplast, and until now it has been difficult to determine to which membrane a given apicoplast membrane protein localizes. To determine the membrane to which TgTic20 localizes, we made use of an established self-assembling split pea green fluorescent protein (GFP). In this system, the C-terminal ␤-strand of GFP (GFP-11) was removed from the remaining 10 ␤-strands (GFP 1–10) of the molecule. This GFP-11 was engineered with the ability to self-assemble with GFP 1–10 if both molecules localize to the same compartment (10). As a proof of principle, we first targeted GFP 1–10 to the apicoplast stroma by adding the N-terminal apicoplast-targeting domain of ferredoxinNADP⫹ reductase (FNR). By itself, this protein was unable to fluoresce (data not shown). We next fused GFP-11 to the C terminus of ACP and transfected this into the FNR-GFP 1–10 line. The resultant parasites revealed GFP fluorescence in the apicoplast (Fig. 2A), which indicated that when both components of the split GFP are targeted to the apicoplast stroma, we observe apicoplast fluorescence. It is possible that the two GFP domains interact in the secretory pathway before entry into the apicoplast, thus limiting the predictive value of the assay. To test this, we generated constructs van Dooren et al. Fig. 3. TgTic20 is essential for growth of T. gondii parasites. (A–C) We monitored growth of parental (A), knockout (B), and complemented (C) parasite lines expressing tandem tomato RFP by a fluorescence growth assay. Cells were grown in the absence (green diamonds) or presence (blue squares) of ATc or incubated for 3 days in ATc before beginning the growth assay in the presence of ATc (red diamonds). Values are presented as percentage positivity, and error bars reflect 1 SD from the mean. Fig. 2. TgTic20 localizes to the inner apicoplast membrane. (A and B) Live images of T. gondii cells expressing FNR leader fused to GFP 1–10, where GFP-11 was fused to the C terminus of either ACP (A) or TgTic20 (B). In both cell lines, green fluorescence colocalizes with the apicoplast stromal marker FNR-RFP. (Scale bar: 2 ␮m.) (C) Live image of T. gondii parasites expressing the secretory marker protein P30 fused to both GFP 1–10 and GFP-11. Green fluorescence localizes to the parasitophorous vacuole. (D) Model for localization of TgTic20. We predict that TgTic20 localizes to the inner membrane of the apicoplast, with the C terminus in the stroma. In silico predictions suggest the presence of four transmembrane domains (Fig. S1). that TgTic20 is an essential protein of the inner apicoplast membrane, we sought to determine its function. First, we measured the time frame for down-regulating TgTic20 expression in the mutant cell line. We harvested parasites after growing them for 0–4 days in ATc and monitored protein levels by Western blotting. Growth on ATc resulted in swift down-regulation of expression of the inducible TgTic20 protein (Fig. 4A, Top). As a more sensitive measure for TgTic20 abundance, we immunoprecipitated TgTic20 protein from ⬇107 parasites. We measured immunopurified protein levels by Western blotting and found that after 2 days growth on ATc, we could no longer detect TgTic20 protein in the mutant cell line (Fig. 4A Bottom). We hypothesized that TgTic20 may function in protein import into the apicoplast. To test this possibility, we established several assays for successful protein import into apicoplasts (Fig. 4B). First, we examined processing of the N-terminal targeting domain of apicoplast proteins, a process that likely occurs subsequent to import into the organelle stroma. Apicoplast-targeted proteins typically reveal two differently sized molecular species: a slow migrating band corresponding to the precursor protein and a faster migrating mature protein where the N-terminal targeting leader has been cleaved (7, 8). We asked whether leader processing was affected in the conditional TgTic20 mutant. 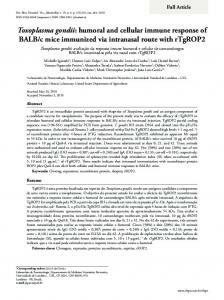 To facilitate these studies, we generated a cell line in the conditional TgTic20 mutant background that expressed a ‘‘synthetic’’ apicoplast-targeted protein, consisting of the apicoplast-targeting leader of TgFNR fused to mouse dihydrofolate reductase [DFHR; a reporter protein typically used for organellar import assays in other systems (15)] and a C-terminal HA tag for detection. To gain a dynamic measure for the timing of defects on protein import in the TgTic20 mutant, we conducted pulse–chase labeling experiments. We incubated mutant parasites growing in host cells for 0, 2, 3, 4, and 5 days on ATc van Dooren et al. and radiolabeled proteins with 35S-amino acids for 1 h (pulse). We then washed out the radiolabel and incubated in medium containing an excess of unlabeled amino acids for an additional 2 h (chase). We purified proteins of interest by immuno- or affinity purification, separated them by SDS/PAGE, and detected them by autoradiography. After 5 days growth on ATc, precursor FNR-DHFR-HA protein was made at levels similar to that formed in cells grown in the absence of ATc, indicating that knockdown of TgTic20 does not affect synthesis of apicoplast-targeted proteins (Fig. 4C). However, after 2 days growth in ATc there is a 35% reduction in formation of mature, processed FNR-DHFR-HA, decreasing to undetectable levels at day 4 (Fig. 4C; Fig. 4D, green diamonds). We also monitored processing of the native apicoplast protein ACP in the TgTic20 mutant. Mature ACP contains only one sulfur-containing amino acid, making detection difficult. The experiment shown in Fig. 4C suggests that ACP is processed at day 2 on ATc and not beyond, but detection levels are too low to draw a definitive conclusion. As a control, we monitored processing of microneme protein MIC5, which occurs in a post-Golgi compartment of the secretory pathway (16). Even after 5 days of incubation on ATc, MIC5 is processed (Fig. 4C), suggesting that TgTic20 knockdown does not affect other parts of the secretory pathway. Although we suspect that precursor protein cleavage is a solid marker for whether proteins are able to traffic into the apicoplast stroma, it has not been formally shown that the processing event occurs here. Therefore, we sought to establish independent measures for successful protein targeting to the apicoplast. Several apicoplast enzymes are modified posttranslationally by cofactors after import into the stroma. One such modification is the biotinylation of acetyl-CoA carboxylase [ACC (17) Fig. 4B], a protein involved in biosynthesis of fatty acids. We purified biotinylated proteins by using an immobilized streptavidin column. Radiolavan Dooren et al. Fig. 4. TgTic20 is essential for apicoplast protein import. (A) Regulation of the inducible TgTic20-c-myc protein. iTic20/⌬Tic20 parasites were grown for 0 – 4 days on ATc. Proteins were extracted and subjected to Western blotting with either anti-c-myc or anti-GRA8 antibodies (as a loading control) or subjected to immunoprecipitation of the inducible TgTic20-c-myc protein followed by Western blotting with anti-c-myc antibodies (Bottom). (B) Schematic depiction of the three protein import assays used in this work. We measured cleavage of preprotein leader sequences by the stromal processing peptidase (SPP), biotinylation of ACC by a holocarboxylase synthetase (HCS), and lipoylation of PDH-E2 by LipB and LipA. All three processes are thought to occur in the apicoplast stroma. (C) Pulse– chase analysis of proteins from the TgTic20 knockout line grown for 0, 2, 3, 4, or 5 days on ATc. Infected host cells were incubated in medium containing 35S-amino acids for 1 h and either harvested (P) or further incubated in nonradioactive medium for 2 h (C). After detergent solubilization, proteins were purified by immunoprecipitation or affinity purification and separated by SDS/PAGE before detection by autoradiography. Protein bands marked by an asterisk in lanes containing biotinylated and lipoylated proteins represent contaminating host cell proteins. The band marked by an asterisk in HA pulldown lanes likely results from the use of an alternative internal start codon representing a shorter cytosolic version of FNR-DHFR-HA. (D) Quantification of bands in C. FNR-DHFR-HA values (green diamonds) were quantified as the percentage of mature protein in the chase compared with the precursor protein after the pulse. ACC-biotin values (red triangles) were quantified as a percentage of the intensity of PC in the same lane. PDH-E2-LA values (blue squares) were quantified as a percentage of the intensity of the lowermost mito-E2 band in the same lane. Values for each day are expressed as a percentage of the no-ATc value. (E) Pulse–chase analysis of proteins from the TgTic20 parental (iTic20/eTic20) line, performed in an identical manner to C.
Fig. 5. TgTic20 is required for apicoplast biogenesis. (A) TgTic20-knockout parasites containing apicoplast-targeted RFP (FNR-RFP) were grown for 0, 4, or 5 days on ATc and subjected to live-cell imaging. (Scale bars: 2 ␮m.) (B) TgTic20 parental (green diamonds) or knockout (red squares) parasites containing apicoplast-targeted RFP were grown for 0 – 6 days on ATc. One hundred four-cell vacuoles were imaged at each time point. We graphed the percentage of vacuoles at each time point where every parasite in that vacuole contained an apicoplast. complexan parasites such as T. gondii must target large numbers of proteins to their apicoplast. Protein targeting occurs via the secretory pathway and requires proteins to cross four membranes before reaching the organelle stroma (5). There has been considerable speculation about how protein targeting across these four membranes is mediated (e.g., 5, 23), but there has been a distinct lack of functional evidence for the various models. Emerging evidence suggests that T. gondii and other Apicomplexa belong to a eukaryotic ‘‘supergroup’’ known as the Chromalveolata (24, 25). Chromalveolates include other major eukaryotic groups such as dinoflagellates and heterokonts (including diatoms and brown algae). A distinguishing feature of chromalveolates is the presence of a plastid that was derived by secondary endosymbiosis from a red alga. Chromalveolate plastids, then, represent a cellular me´nage a trois of three ‘‘founder’’ organisms: a cyanobacterium, a red alga, and a heterotrophic eukaryote. An early requirement in the acquisition of plastids is the evolution of protein import machinery. An intriguing evolutionary question is which of these founders ‘‘donated’’ the import machinery and whether the origin of individual translocons is tied to the origin of the membrane they cross. Three types of translocons of have been speculated to potentially act in apicoplast protein import: primary plastid-derived Tic and Toc complexes and, more recently, Der1-containing complexes retooled from their original role in protein retrotranslocation across the ER membrane (12). In this work, we show that the innermost apicoplast membrane is crossed using machinery derived (at least in part) from the inner membrane Tic translocation complex of the red algal chloroplast, and we note that Tic homologs are present in other chromalveolates such as diatoms [Fig. S1 (23)]. Rather than evolving a fundamentally different means of protein import into secondary plastids, Apicomplexa and their chromalveolate cousins made use of the machinery already available from their primary plastid progenitors. It remains to be determined whether components of the Toc and Der1 complexes mediate import across other apicoplast membranes. The approaches for characterizing and localizing candidate apicoplast import proteins that we describe here provide an experimental framework to test these hypotheses conclusively. van Dooren et al. Parasite Culture and Manipulation. Parasites were passaged in human foreskin fibroblasts and genetically manipulated as described in ref. 26. GenBank accession number for TgTic20 is EU427503. Plasmid construction and flow cytometry techniques are described in detail in SI Materials and Methods. All parasite strains described in this work were cloned by either limiting dilution or flow cytometry. Where indicated, parasites were grown in anhydrotetracycline (IBA) at a final concentration of 0.5 ␮g/ml. Microscopy. Immunofluorescence assays and light microscope imaging were performed essentially as described in ref. 26. Detailed procedures for electron microscopy are included in SI Materials and Methods. Immunoprecipitation, SDS/PAGE, and Immunoblotting. For pulse– chase analyses, infected host cells were radiolabeled with 100 ␮Ci/ml [35S]methionine/ cysteine (GE Healthcare) for 1 h. Cells were either harvested (pulse) or washed twice and incubated in parasite growth medium lacking radioactive amino acids for 2 h (chase) before harvesting. Proteins of interest were purified by immunoprecipitation or affinity purification and separated by SDS/PAGE using standard procedures (8) and detected by autoradiography or PhosphorImaging (GE Healthcare). Immunoblotting, sodium carbonate extractions, and Triton X-114 phase partitioning were performed by standard procedures. Detailed protocols are described in SI Materials and Methods. ACKNOWLEDGMENTS. We thank Geoff Waldo (Los Alamos National Laboratory), David Sibley (Washington University), Manami Nishi (University of Pennsylvania), Marc-Jan Gubbels (Boston College), and Markus Meissner (Heidelberg University) for plasmids; Jo¨rn Lakowski (University of Georgia) for mouse cDNA; and Vern Carruthers (University of Michigan), Gary Ward (University of Vermont), and Geoff McFadden (University of Melbourne) for antibodies. We are grateful to Carrie Brooks, Lisa Sharling, Kylie Mullin, and Geoff Waldo for technical advice and discussions and especially to Julie Nelson of the Center for Tropical and Emerging Global Diseases Flow Cytometry Facility for performing cell sorting. This work was supported by C. J. Martin Overseas Fellowship 400489 from the Australian National Health and Medical Research Council (to G.G.v.D. ), the European Network of Excellence ‘‘Three-Dimensional Electron Microscopy,’’ FP6, and the Dutch Cyttron Consortium (to C.T. and B.M.H. ), and National Institutes of Health Grant AI 64671 (to B.S.). 1. Rodriguez-Ezpeleta N, et al. (2005) Monophyly of primary photosynthetic eukaryotes: Green plants, red algae, and glaucophytes. Curr Biol 15:1325–1330. 2. Mazumdar J, Wilson EH, Masek K, Hunter CA, Striepen B (2006) Apicoplast fatty acid synthesis is essential for organelle biogenesis and parasite survival in Toxoplasma gondii. Proc Natl Acad Sci USA 103:13192–13197. 3. Ralph SA, et al. (2004) Tropical infectious diseases: Metabolic maps and functions of the. Plasmodium falciparum apicoplast. Nat Rev Microbiol 2:203–216. 4. Soll J, Schleiff E (2004) Protein import into chloroplasts. Nat Rev Mol Cell Biol 5:198 –208. 5. Hempel F, et al. (2007) Transport of nuclear-encoded proteins into secondarily evolved plastids. Biol Chem 388:899 –906. 6. Tonkin CJ, et al. (2008) Evolution of malaria parasite plastid-targeting sequences. Proc Natl Acad Sci USA 105:4781– 4785. 7. Waller RF, et al. 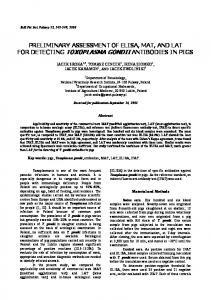 (1998) Nuclear-encoded proteins target to the plastid in Toxoplasma gondii and Plasmodium falciparum. Proc Natl Acad Sci USA 95:12352–12357. 8. van Dooren GG, Su V, D’Ombrain MC, McFadden GI (2002) Processing of an apicoplast leader sequence in Plasmodium falciparum and the identification of a putative leader cleavage enzyme. J Biol Chem 277:23612–23619. 9. Karnataki A, et al. (2007) Cell cycle-regulated vesicular trafficking of Toxoplasma APT1, a protein localized to multiple apicoplast membranes Mol Microbiol 63:1653–1668. 10. Cabantous S, Terwilliger TC, Waldo GS (2005) Protein tagging and detection with engineered self-assembling fragments of green fluorescent protein. Nat Biotechnol 23:102– 107. 11. Striepen B, He CY, Matrajt M, Soldati D, Roos DS (1998) Expression, selection, and organellar targeting of the green fluorescent protein in Toxoplasma gondii. Mol Biochem Parasitol 92:325–338. 12. Sommer MS, et al. (2007) Der1-mediated preprotein import into the periplastid compartment of chromalveolates? Mol Biol Evol 24:918 –928. 13. Meissner M, Schluter D, Soldati D (2002) Role of Toxoplasma gondii myosin A in powering parasite gliding and host cell invasion. Science 298:837– 840. 14. Gubbels MJ, Li C, Striepen B (2003) High-throughput growth assay for Toxoplasma gondii using yellow fluorescent protein. Antimicrob Agents Chemother 47:309 –316. 15. Eilers M, Schatz G (1986) Binding of a specific ligand inhibits import of a purified precursor protein into mitochondria. Nature 322:228 –232. 16. Brydges SD, Harper JM, Parussini F, Coppens I, Carruthers VB (2008) A transient forward targeting element for microneme regulated secretion in Toxoplasma gondii. Biol Cell 100:253–265. 17. Jelenska J, et al. (2001) Subcellular localization of acetyl-CoA carboxylase in the apicomplexan parasite Toxoplasma gondii. Proc Natl Acad Sci USA 98:2723–2728. 18. Crawford MJ, et al. (2006) Toxoplasma gondii scavenges host-derived lipoic acid despite its de novo synthesis in the apicoplast. EMBO J 25:3214 –3222. 19. Chen X, Smith MD, Fitzpatrick L, Schnell DJ (2002) In vivo analysis of the role of atTic20 in protein import into chloroplasts. Plant Cell 14:641– 654. 20. Kouranov A, Chen X, Fuks B, Schnell DJ (1998) Tic20 and Tic22 are new components of the protein import apparatus at the chloroplast inner envelope membrane. J Cell Biol 143:991–1002. 21. Reumann S, Inoue K, Keegstra K (2005) Evolution of the general protein import pathway of plastids. Mol Membr Biol 22:73– 86. 22. Teng YS, et al. (2006) Tic21 is an essential translocon component for protein translocation across the chloroplast inner envelope membrane. Plant Cell 18:2247–2257. 23. McFadden GI, van Dooren GG (2004) Evolution: Red algal genome affirms a common origin of all plastids. Curr Biol 14:R514 –R516. 24. Fast NM, Kissinger JC, Roos DS, Keeling PJ (2001) Nuclear-encoded, plastid-targeted genes suggest a single common origin for apicomplexan and dinoflagellate plastids. Mol Biol Evol 18:418 – 426. 25. Moore RB, et al. (2008) A photosynthetic alveolate closely related to apicomplexan parasites. Nature 451:959 –963. 26. Striepen B, Soldati D (2007) Toxoplasma gondii, the Model Apicomplexan: Perspectives and Methods, eds Weiss LD, Kim K (Elsevier, London), pp 391– 415. 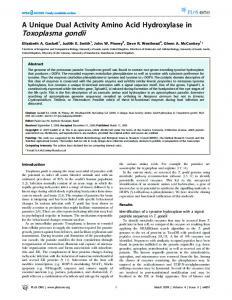 Report "Toxoplasma gondii Tic20 is essential for ... - Semantic Scholar"